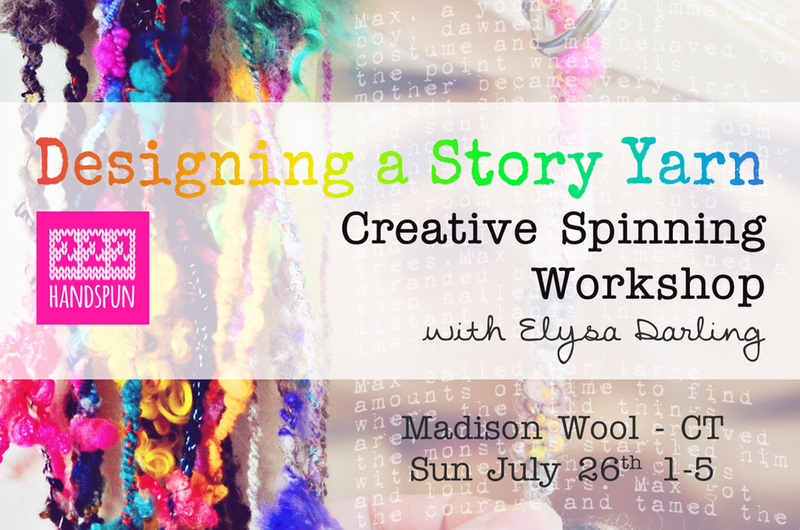 In this workshop you will learn how to design and create a narrative art yarn using color, texture, and spinning techniques to tell your unique story. We’ll look at influences in traditional and contemporary storytelling, the meaning of colors and building palettes, selecting fiber, and creating texture by combining different fiber prep and spinning methods. Fee: $45 ($20.00 deposit holds your space). To register, contact Madison Wool at 203-245-5921 with your information and deposit (credit card). 1) About 4 oz. of fiber. What type of fiber should you bring? Anything you like, but in particular washed fleece, dyed locks, yarn cones, fuzzy mohair blend lace weight yarn for corespinning, sparkle, beads, shells, feathers, or any other found objects that can be spun are good choices. A selection of 222 Handspun art batts and loose fiber packs will be available for you to purchase. There will be a free fiber sharing table that you can sample from. You are also welcome to bring your own special fiber to play with, share, or trade with other attendees. 3) A print out of words or a picture of a story that you want to tell: For example a movie, song, sonnet, artwork, fairytale, folktale, myth, legend, fable, etc., or just about anything that has a point of view, characters, or narrative and inspires you.